Fundamentally, whether you support Trump’s or Clinton’s tax plans is determined by your stance regarding the amount of power the government should have and what the government should be expected to do for its constituency. Miraculously, the second presidential debate actually provided viewers with a fairly comprehensive overview of the candidates’ stances on several issues. The debate predictably began with Anderson Cooper asking Trump to explain the audio recording that was released last Friday where he explicitly discussed his sexual relations with women. Trump responded, “It’s just words, folks, it’s just words.” He continued, “It was just locker room talk,” and mentioned the fact that Clinton has also talked poorly about women, specifically about the women who accused Bill Clinton of taking advantage of them. Clinton replied, noting that Trump never apologizes for anything he does, referencing the incident when Trump mocked a reporter’s disability and his comments about Captain Khan’s family. A suicide bomber in Iraq killed Captain Khan, a Muslim American. Khan’s father spoke out against Trump’s proposal to ban all Muslims from immigrating to the U.S. at the Democratic National Convention, and in turn, Trump was critical of the Khans’ intentions. 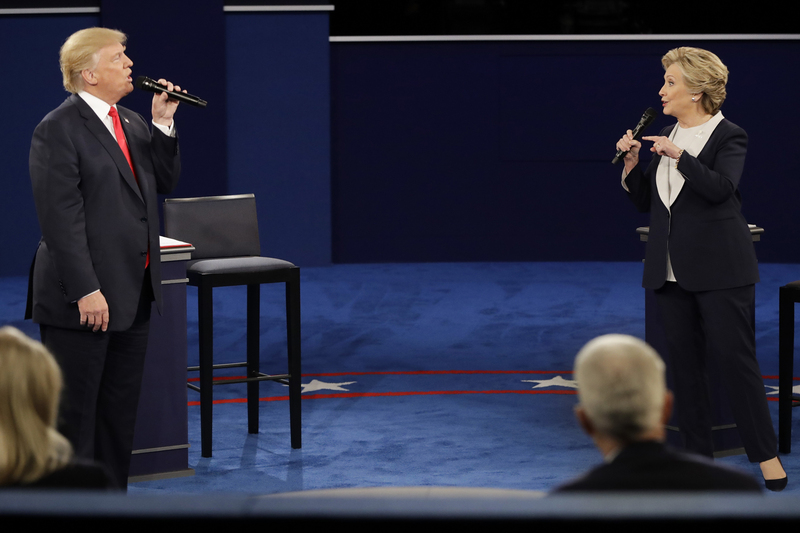 Following discussion about the audio recording of Trump, the debate turned to the Affordable Care Act. Trump said that he feels Obamacare is a disaster, revealing that he would abolish it and replace it with another system that ensures continued competition among insurance companies and the ability to buy insurance across state lines. Trump claimed that Clinton supports a single-payer system, but she does not, although she does support Obamacare. Clinton feels that getting rid of Obamacare, which has reduced the number of uninsured citizens, would result in that number rising once again. Clinton’s proposed health care strategy would cost $90 billion, supposedly increasing the number of insured individuals by 400,000, while Trump’s plan would decrease the number of insured individuals by 9 million, but only cost $41 billion. Trump believes that permitting buying insurance across state lines would encourage greater competition, but it might also result in a loss of protection if citizens are allowed to buy into lower-regulation states. He also advocates for guaranteeing lower premiums, as premiums have risen under Obamacare. It is essential that all Americans have access to health care, but it is extremely difficult to ensure universal coverage without compromising the quality of that care while keeping premiums low. Buying across state lines would virtually null states’ individual ability to control healthcare, leading to an abandonment of standards in an effort to keep up with the market. The refugee crisis and illegal immigration were also discussed at length. Hillary Clinton is a proponent for bringing in as many as 65,000 refugees from Syria, more than five times as many than the 10,000 that were brought in this year under the Obama administration. Trump fervently opposes bringing in refugees and calls for extreme vetting. Clinton assured viewers that she is against letting anyone into the country who would pose any risk to American safety. In terms of the candidate’s stances about allowing or disallowing refugees from entering, there is no way to absolutely guarantee that they wouldn’t pose a risk. Clinton noted that the U.S. fails to do their part in aiding to absolve the humanitarian crisis coming out of Syria when compared to what other countries in Europe have done, but she failed to mention that the State Department issued a summer travel alert for Europe as a result of terrorist activity. If the U.S. refugee policy was more similar to that of its European counterparts, one could logically conclude that the threat of terrorism in the U.S. would more closely resemble the current threat in Europe. Regarding tax policy, Clinton wants the wealthiest segment of the population, specifically those making more than $5 million annually, to pay more, and it is estimated that her plan would raise $1.1 trillion over the next decade. Trump’s prominent goal involves cutting the corporate tax rate to 15% and decreasing income taxes, subsequently reducing federal revenue by nearly $6 trillion. Fundamentally, whether you support Trump’s or Clinton’s tax plans is determined by your stance regarding the amount of power the government should have and what the government should be expected to do for its constituency. The government obviously needs enough power to ensure efficient functioning of essential programs that guarantee basic rights, but not so much power to the point where it stifles the free market. The economic prosperity of this country is ultimately dependent on the success of American business, but it is also important that members of the bottom financial strata are allowed the opportunity to improve their standard of living, and that often calls for some level of government intervention. Clinton’s proposition to raise the taxes for members in the upper echelons of the income ladder would ease some of the pressure on small business owners, while leaving even the majority of upper class Americans unaffected. Trump’s plan to cut taxes on businesses is also appealing. Many Americans are in support of lessening the power of corporations, but large corporations not only create thousands of jobs but can mobilize social movements. From Procter & Gamble to Goldman Sachs, a laundry list of huge companies opposed bans on gay marriage. As long as these companies refrain from dominating their respective markets, they can spur economic development and act as a check on the U.S. government. By raising taxes for the wealthiest Americans who are often responsible for running large corporations, the risk that these Americans become unable to run their businesses effectively increases. However, in 1993 when taxes were raised in order to lessen government deficit, the economy continued to grow throughout the rest of that decade. It is impossible to ascertain the long-term effect of raising or lowering taxes, and a combination of the candidates’ tax policies could spur economic growth while shrinking the income gap. Eliminating tax breaks capping deductions could also increase government revenue without even touching the tax rates. In terms of foreign policy, Clinton sympathized with the Syrian rebels over Assad, but Trump replied that Clinton doesn’t know who the rebels are. He made the point that by arming the rebels, the U.S. government could ultimately be supplying ISIS if the resources end up in the wrong hands. He also used the incidences surrounding Gaddafi’s death as an example of attempts to aid the rebel forces that had unintended consequences. Clinton disapproves of Russian bombing of Syria because it often results in the injuries and deaths of civilians. She called for safe zones and specifically targeting Baghdadi, the leader of ISIS. Trump supports Russian bombing and believes that Assad’s efforts are helping to eliminate ISIS. It isn’t the job of the U.S. to heavily involve itself in foreign affairs, but ISIS is directly targeting Americans. The U.S. should be involved as far as efforts go to counteract ISIS advances, but should try to stay out of the civil war in Syria. Although bombing is contributing to an ever-growing humanitarian crisis, if it is effective at pushing back ISIS then it should continue. However, it is speculated that Russia is using ISIS’ presence in Syria as an excuse to target Assad’s opponents. Trump disagreed with his running mate, Mike Pence, who noted in last weeks vice presidential debate that the U.S. should actively oppose Assad if Russian bombing continues to target the rebels in Aleppo, rather than ISIS. President Obama has been critical of Russian and Iranian involvement in Syria, fearful that it is contributing to extremism. The U.S. should not support Russia as unquestionably as Trump advocates, given their volatility, though it is difficult to disagree with Trump’s desire to quickly and efficiently eliminate ISIS. The humanitarian crisis in Syria is pressing, but it is debatable whether or not it is the mission of the United States to intervene on behalf of Syrian civilians. At the end of the debate, after an audience member asked Trump and Clinton to describe a trait possessed by the other that they admired, Clinton noted that Trump’s “incredibly able and devoted” children must say something about Trump himself, and Trump complimented Clinton’s consistent fervor and determination.